Have you found an online vendor selling Wild Tiger Special Reserve? 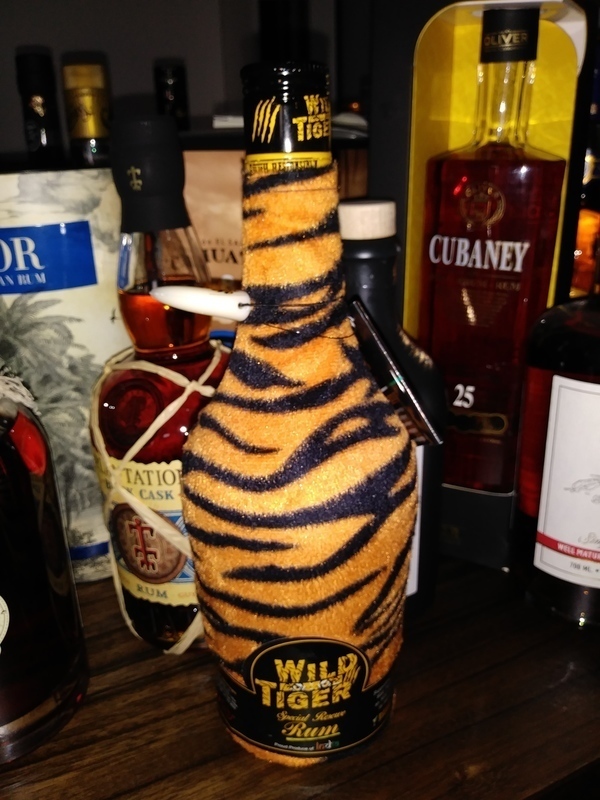 Wild Tiger Special Reserve rum is produced in India using a blend of molasses and cane juice distillates, before aging in American oakwood casks which once stored Bourbon Whiskey. 10% of Wild Tiger's profits are donated to the Wild Tiger Foundation to protect Tigers around the world. I Just love tigers! 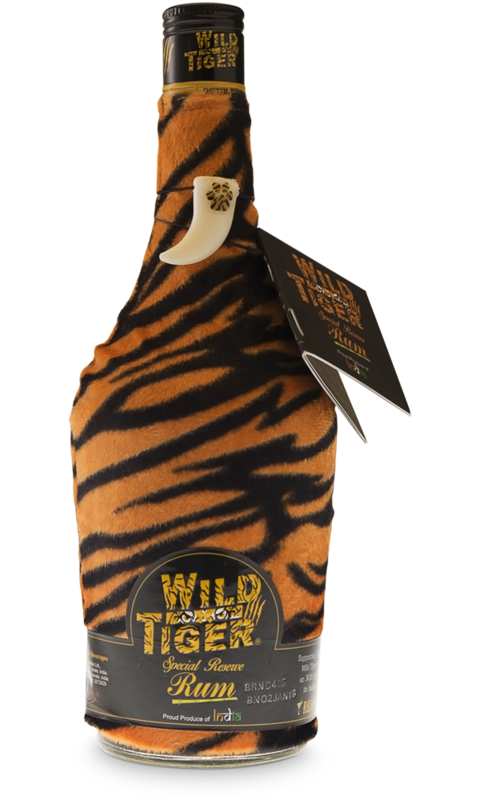 - So what not to love when you can buy Wild Tiger Rum, and then support those fantastic loveable animals? Enjoyed a bottle of Wild Tiger with my buddies while vacationing in Germany. Velvet covered bottle, very fancy. Harsh alcohol smell to the nose and palate. Nothing but vanilla extract on the flavor profile. Mix it, and down it goes, but just barely. I love the bottle and the fact that some money supposedly goes to tiger preservation. It is cheap. In the UK about the same price as a Mount Gay Eclipse, or perhaps 5-10% more. The nose reveals what is wrong with this. Sweetness. I am presuming that it has added sugar as it is far too sweet. Having said that, it really is quite easy to drink, which after all is the most important thing. If you are in the mood for a more alcoholic and less sickly version of Baileys, then this hits the spot. I'm just not sure how often I am in that mood. Overall, I've had far worse rums at higher prices than this. I would give this a 5½. 20ml uit een advent kalender. Te weinig om echt in te duiken.. hout, rokerig maar wat zoetig. Nice vanila aroma. Taste is not so good - strong ethanol. Aftertaste missing. Smell not bad, fruity, vanilla, taste with more alcohol flavour. Mid range & and love to support tigers. Not a premium rum by any means, you buy this for the packaging and for the noble cause behind it. Which is exactly what I did, and it revealed itself to be a decent mixer for a lazy night. Very sweet and not very complex with strong banana and even stronger vanilla hits. A basic rum that is not great by any means but is not horrible by any either. Great Packaging and noble cause. Very few Tigers in the world remaining. The Rum itself it unique because of Molasses and Agricole blend. Lot of nice Vanilla and Toffee notes. Little bit zesty and over all a decent pour for the price. Now I may try the spicy one. This is the first Indian rum that I have tried. I was surprised to learn that they produce more rum than any other country in the world, but here the quality do not match the quantity. Nose: Roasted wood, cocoa and vanilla. Taste: Very, very sweet with notes of fruits and vanilla. I can´t describe the aftertaste, but it is not good. Overall: First serious attempt from India in the world of premium rums....better luck next time. Smell of cinnamon is really strong, but after first burn there is nothing left at all. 5 seconds and its gone. Dufter godt, men smager ikke af så meget, og derfor er den lidt kedelig. Det er ikke fordi den ikke kan drikkes rent, men den gør sig nok bedre i en Dark'n'Stormy. Sehr dunkles Bernstein im Glas. In der Nase überraschend vielschichtig für einen Rum im Plüsch. Ein Sahnebonbon im Fruchtsalat, extrem süss mit eleganten Holznoten. Im Gaumen eher grüne Bohnen mit Curry als Rum, sehr speziell. Zwischendurch flackert ein wenig Karamell und Holz auf. Jetzt hab ich Lust auf eine Portion Curry-Reis. Im Abgang ein Wenig künstlich Fruchtig Kaugummiartig. Zugunsten der Tiger, für alle Rum- und Tigerfreunde. Very dark amber in the glass. In the nose surprisingly multi-layered for a rum in the plush. A creamy sweet in fruit salad, extremely sweet with elegant woody notes. On the palate more green beans with curry than rum, very special. In between flickers a little caramel and wood. I want a serving of curry rice. In the finish a little artificially fruity gum. In favor of the Tiger, for all Rum and Tiger friends. #12 i romkalendern 2017, betyget sammanfattar intrycket. Dufter og smager meget syntetisk. Bestemt ikke anbefalelsesværdig. Glad I tasted it before buying, from the bottle this would fit nicely on the shelve, but after tasting, not so much. This one is not for me, a bit syntetic I would say. Vanilj i doften lite stickig. Citrus i smaken, lite spritig. On the palate creamy and smooth with prominent undertones of molasses, candied orange peel, almond and slight oak notes. It is medium-bodied with a complexity of flavours and a lingering aftertaste. In the nose aromatic sweetness, pralines, toffee. Taste is quite enpleasant, some fruity sweetness and not cool bitterness in the finish. Som andra säger är den syntetisk. Smakar billig likör, typ värre än likör 43.